When do they matter, when do you care, when do you turn it on them? As I gloat at the fact that Nick Wooster himself followed us on Twitter; I can’t help, but think about the “critiques” you receive from people you couldn’t care less about or what if it’s your wife or simply someone you’re trying to impress? Do you take the criticism? Was it constructive or down right negative, and totally uncalled for? Do you play the bigger person by letting them finish or do you give them a dose of their own medicine? I find working in Fashion, presentation is very important! Duh, right?! Well not necessarily, because we’ve all ran into those people in the fashion industry who just don’t have it together look wise, but they’re great at what they do! I often keep my assertions of other people’s attire to myself, because unless they look up to you or you have that one on one relationship its thin ice telling someone what they should have done or just out right being blunt and saying you hate their garment! 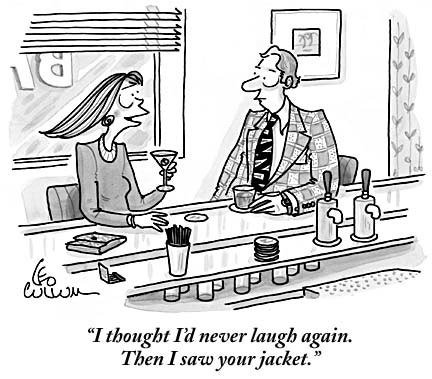 Take this illustration for example she made an ill-mannered joke about his jacket! He could’ve spun this into a joke about her grotesquely stiff hair, but let’s assume he played the gentleman’s card, and waltzed away? So I ask you all, when is it okay to share your opinion on what someone is wearing, and by sharing I mean sharing with them. Not your buddy in the cubicle next to yours who obviously agrees it was a poor choice. When is it okay? When is it not okay, and how you do you react? Are critiques all their cracked up to be or are they just, you know; not needed? It’s one thing to suggest an alternative or say hey, I wish you would’ve worn these sneakers or that jacket. It’s another to come across a person who doesn’t give a damn about what you think, and now they think a lot less of you than they did before you made you obviously subjective, and unwanted comment. Shall we tread lightly in a world that isn’t always about Freedom of Speech? ← Ladies Do You Tote Phillip? see this is where things get tricky, because some people just want to help, but then there’s other people who want to hurt.